Glitz Design: "Get Your Glitz On" Challenge #1 Winners!!! "Get Your Glitz On" Challenge #1 Winners!!! It is time to announce the winner & Top 5 projects from the first "Get Your Glitz On" challenge! Each and every project that you guys submitted to the challenge was amazing! Thank you so much for submitting, and we hope that you will continue to participate!! Your layout is utterly gorgeous, Nadia!! We love all the layered elements you've included on this layout, and the photo is so sweet!! Wonderful job, and congratulations on winning the prize!! Please email me with your address information to glitzdt@gmail.com. We will get the prize on its way to you! Nadia's layout is part of the Top 5, along with the rest of these amazing projects!! This is such a pretty card, and I love all the amazing layering included on it! I also believe that this fabulous little thing was a featured project at Two Peas in a Bucket...which is awesome! Congrats on that, and congrats on being in the Top 5!! Sarah created this A-MA-ZING mini album!! I have only included an image of the cover, so be sure and click on the link that is her name....because you are going to want to see this creative little beauty! I was in awe just looking at every detail she added into the pages!! I just love this beautiful floral topiary that Betik created!! It is so pretty and full of wonderful details! She also has some great detail shots on her blog, so check out her post to see this gorgeous creation up close and personal!! 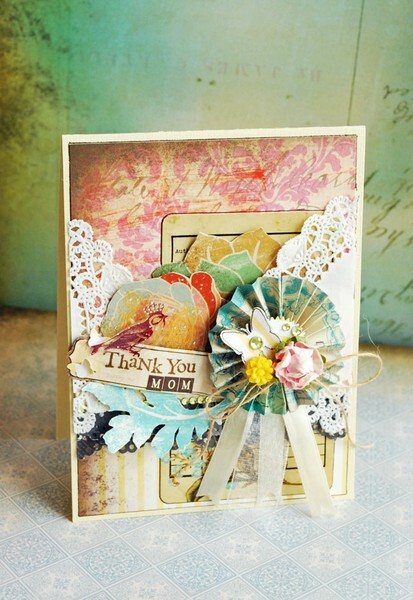 This lovely shaped card rounds out the Top 5 projects, and it is just so sweet and lovely!! I love all the gorgeous floral details and the wonderful shabby chic feel of it!! Congratulations to all the Top 5 winning projects!! And thank you to everyone who participated...we LOVED seeing all your amazing projects!! Please give these ladies some love in the comment section!! The next "Get Your Glitz On" challenge will be live in just a couple of hours!! YAY! Incredibly happy here..there were SO many outstanding projects entered so THANKS so much for picking mine! It means the world to me. CONGRATS to the Top 5 too. xoxox Nadia. Congratulations!! Those are breathtaking projects! Congratulations Nadia and to the rest of the top 5! Your projects were great!!!! Thank you so much Glitz & congrats to Nadia & the top 5! You're amazing! WOW! Congrats on such awesome work ladies!! Such beautiful, inspiring work! Well done to everyone that got their Glitz on for the challenge!